This year marks the beginning of a whole new world behind the scenes of WinterWonderGrass: The Media Tent. 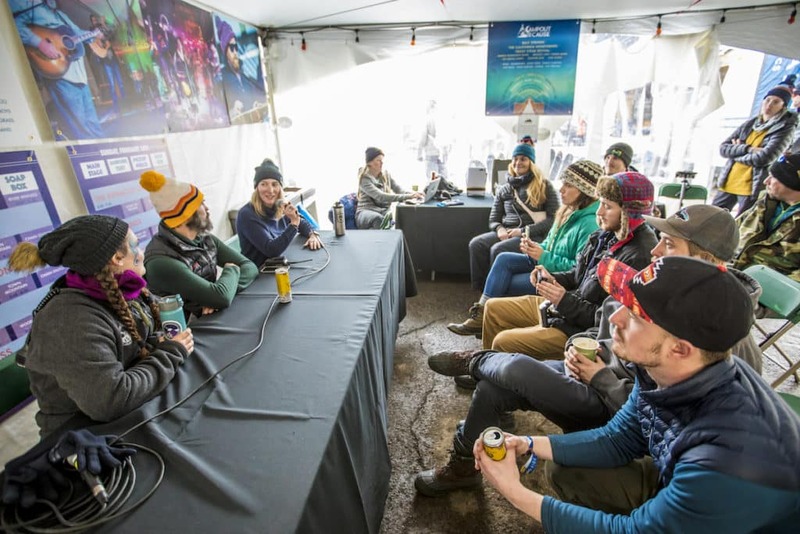 It’s a space for media personnel and photographers to keep their gear safe, charge up, and participate in panel discussions about issues and causes that are central to Festival. WinterWonderGrass’ media tent and partnerships are curated by level, a philanthropic consulting firm that helps brands and businesses make an impact. For WWG, that means getting the word out about the core values of the festival and creating opportunities for partners, media, and artists to connect on a deeper level. The first panel (ever!) focused on sustainability, featuring hosts Marina McCoy of Waste Free Earth, Bridget Law (Elephant Revival, Bridget & Tierro Band), and Scotty Stoughton, the Founder of WinterWonderGrass. When Marina and Scotty first met at the Tahoe WinterWonderGrass, he quickly realized how seriously she takes sustainability and brought her on as the driving force behind festival greening. The panelists spoke about the issue of “greenwashing” and how to avoid it. Greenwashing is the use of marketing to portray an organization as environmentally friendly when in reality they are not. As we all know, it takes hard work and diligence to be green. Often times, it’s the financial side of sustainability that causes companies to greenwash. WinterWonderGrass consistently chooses the more costly option if it means the festival is truly being green. A festival could shout all day about how sustainable their event is. When sponsors and vendors are chosen for the event not because of how many thousands of dollars their company offered to be there, but because of their commitment to their local communities and to sustainable practices, that’s when you know you aren’t being greenwashed. While traveling extensively on the road, Bridget Law and her band Elephant Revival were notorious diligent and thoughtful about how their day-to-day lives affected the environment. Bridget spoke about how the best advice she could give someone is to just get in the habit of bringing everything you need for the day when you leave the house in the morning. It takes getting used to, but bring a water bottle, to go container, and utensils with you every day, and you’ll see a drastic change in your single-use plastic usage. Imagine those times you’ve been to a live music event and stayed until the crowd cleared out. Most of the time what’s left behind is a massive sea of plastic cups and other waste. Though no crowd is perfect, WinterWonderGrass attendees consistently leave behind less trash than those of other music festivals. Everything that finds its way to the ground eventually finds itself to the right receptacle, sometimes by the thoughtful folks that pick up trash that didn’t belong to them on their way out of the venue, and sometimes by the incredible thorough Waste Free Earth team. Why are the fans of this festival consistently so awesome? It starts from the ground up, beginning with the event producers, the artists, the vendors, and the partners, and then the ripple continues. One of the highlights of this panel was Marina’s perspective on how the guidelines and expectations for vendors have actually helped them find eco-friendly solutions that have ended up saving them thousands of dollars. She spoke about how CBD company Saving Grace planned to spend a large chunk of their marketing dollars on paper handouts until they found out that wasn’t allowed. With the help of the festival, they found a free solution that lets them reserve that large chunk of money for other endeavors. There’s a 5-year sustainability plan for this festival to be even better. For all three of these amazing panelists, there’s a desire to continue to raise the bar from year to year and to lead by example.